Part of the Disney licensed range by Obaby, this 101 Dalmatians cot bed thoughtfully combines clean and contemporary design with the delightful addition of the full colour, 101 Dalmatians illustrations on the cot bed end. As your child grows, learning to sit and stand, the mattress base can be lowered, with three base heights available in total, providing extra security and reassurance. The cot bed then converts effortlessly from a cot of the highest quality into a cosy and stylish junior bed. This is done by simply splitting down both ends and removing the fixed sides, meaning minimal disruption during little oneâ€™s often daunting transition. Once the change is complete, the bed can be suitable for a child up to approximately 4 years, making the Disney cot bed both extremely durable and great value. 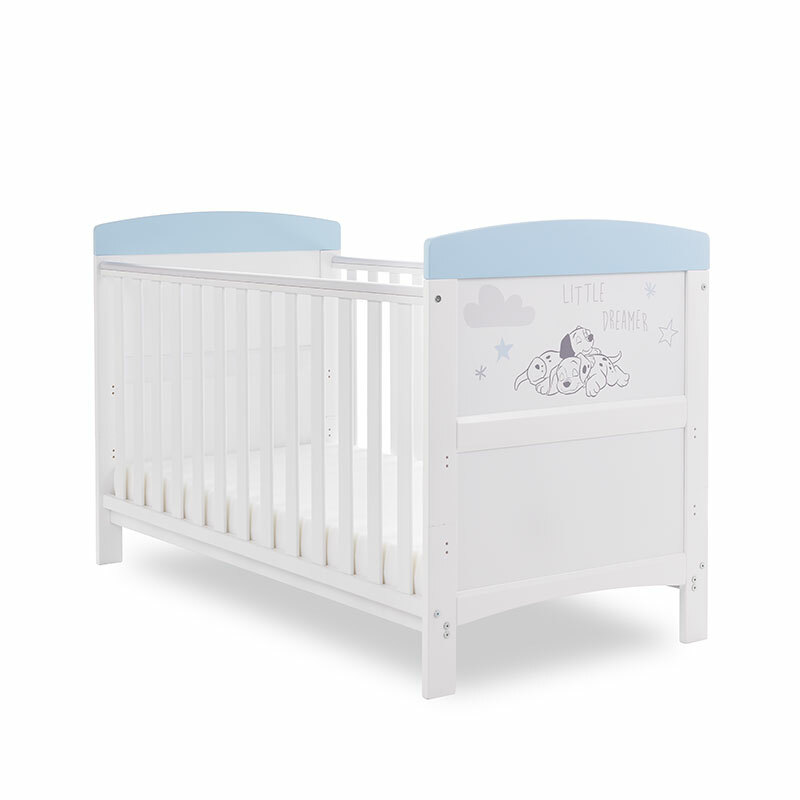 The open slatted sides are perfect for watching over your little treasure during their most peaceful times and the teething rails ensures your childâ€™s delicate first teeth are protected. The 101 Dalmatians cot bed strikes the perfect balance between modern and classic designs and will look perfect within any nursery.